Basil's Blog: Gimme a "K"
The new Android operating system has been announced. 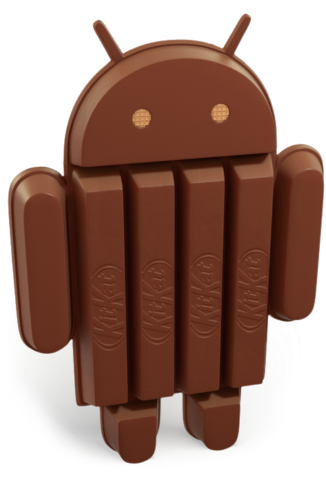 Android 4.4 will be ... KitKat. Really. In case you didn't know, or just weren't paying attention, Google names its Android operating systems after snacks, and in alphabetical order. Mostly. One source says that after the first Android OS, the next release, version 1.1, was codenamed "Petit Four," which is some kinda French snack cake, but that name isn't officially listed by Google. Since then, though, the third one, Cupcake, began the alphabetical snack release: Cupcake, Donut, Eclair, Froyo (frozen yogurt), Gingerbread, Honeycomb (for tablets only), Ice Cream Sandwich, Jelly Bean, and now, KitKat. Seriously? Programmers don't know what Key Lime Pie tastes like? While, sure, it's a southern dessert, I'm just stunned that it's an unfamiliar taste. What foods with "K" would programmers know about? Ketchup. Krispy Kreme Donuts. Kraft Macaroni & Cheese. Kool-Aid. Wait. Scratch that last one. I think us iOS users drank all that. Any good "K" foods that Android should've used? Whaddaya think? I don't know about "K", but I'm ready for "L": Lutefisk! H u s k e r d u! Mmmm. I bet Anonymiss has a recipe for those. Kiwi - nope, that's racist against New Zealanders! There's a whole list of K foods if you google it, but I'd admit the pickin's are slim if you want to keep it something common and American. My favorite: Kreplach! I've never had that. I imagine it tastes a lot like lemon cream pie, but more limey. No homo. 1/2 cup key lime juice, 14 oz sweetened condensed milk and three egg yolks mixed together well. created as a no bake pie for the keys and fishing boats. the lime juice did the cooking. now generally 15 min at 350 degrees, though i cook the filling on the stove top. really not like lemon cream. @#11: It's "kielbasa". Trust me. Two of my grandparents were born in Poland. Wow! No tears shed over the poke at Apple zombies? I like this place! Conservatives who are also Apple users (like me) can laugh at ourselves. We laugh at stupid liberals more, of course. Conservatives who are also Apple users (like me) can laugh at ourselves. Not as much as the rest of us can. Dumb question, but what's the difference between a Key Lime and a regular lime? They taste different. Look different, too. Key Limes have a yellowish appearance, contrasted with the others' green. The key to a good pie is lime in your gin. yes, key limes are smaller, slightly different in color and more tart. also, they originate in the florida keys. i have used the more standard limes (persians) in lime pies with, i think, good results. also done it with lemon juice. Yeah, I've noticed that generally all stripes of conservatives (and even those libertarian types) can laugh at themselves. Kinda like grown-ups. Coincidence . . . ?